On the 19th April 2016 a photograph of a damaged M60T tank have been posted on the internet. The tank was attacked by terrorists using supposedly a Russian Kornet (9M133, NATO reporting name AT-14 Spriggan) anti-tank guided missiles (ATGMs). Jane's also reported on this matter. The M60T tank is a version of the Sabra Mark 2 tank upgrade by the Israeli Military Inudstries (IMI) developed for the Turkish Army. It is based on the Sabra upgrade for the M60 main battle tank (MBT). The Sabra add upgrade includes additional special armor (composite and/or reactive armor), a 120 milimetre smoothbore gun, the Knight fire control system (FCS) and upgrades to the engine aswell as the transmission. In case of the Sabra Mark 2 on which the M60T is based, the M60's AVDS-1790 engine and Allison transmission are replaced with the MT881 engine and Renk R304S transmission from the German companies MTU and Renk. The armor solution has been described as hybrid armor, which might suggest a type of ERA in combination with passive armor. However also the combination of non-explosive reactive armor types (NERA, NxRA) with passive armor has been described as hybrid armor. 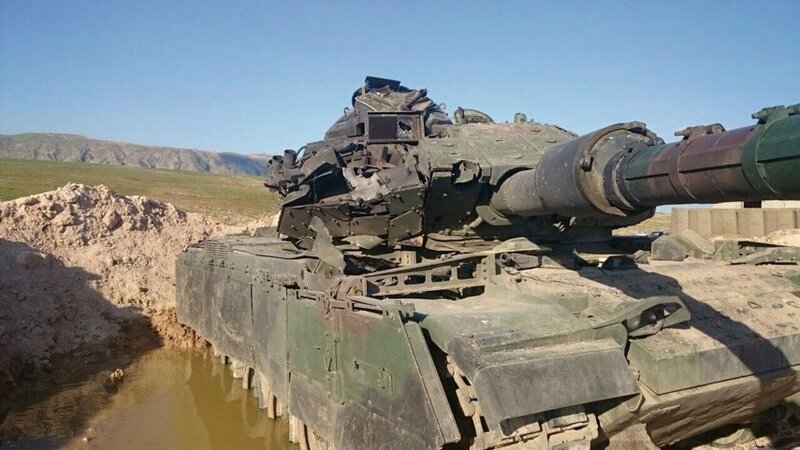 Following the release of the photograph of the damaged tank, a lot of different claims and opinions on the matter of the effectiveness of tanks, the M60T's armor, ATGMs and the Kornet have been made. While some of these claims and opinions are based on a careful evaluation of the available information and on a reasonable thought process, it appears that a lot of people have abused the incident for preaching their own beliefs — "tanks are dead", "Turkish M60 tank is better armored than Russian T-90", "missiles cannot penetrate ERA/modern armor". So, what should one learn from the incident? Is the M60T Sabra tank able to survive a Kornet ATGM under all circumstances? Can it survive a Kornet ATGM at least frontally? Or can any old, last generation tank be upgraded with a lightweight armor package to survive an impact from the Kornet ATGM? Is the Kornet weaker than other ATGMs? First of all, let's take a few looks at the M60T/Sabra and the Kornet ATGM. The M60T is based on the M60 tank from the 1960s. It uses the original turret and chassis, but has additional hybrid armor laid over the steel construction. How much armor? An approximation for this answer can be found by looking at the vehicle weight: The M60T has supposedly a weight of 59 metric tons - that is between 7 and 8 metric tons heavier than the original M60 model on which it is based. The weight increase is however not only the result of the new armor modules, but is also related to the 120 mm smoohtbore gun, the heavier powerpack and new fire control system components. Just for the reference, the weight of the composite armor modules of the original Leopard 2 turret only (from 1979) supposedly is 8 metric tons, while the turret is considerably smaller! Yes, the original Leopard 2 uses older armor, but instead of just replacing the old armor modules during future upgrades, additional armor was installed, increasing the turret weight by about 5 metric tons. The Kornet ATGM is meant to combat modern main battle tanks from the front - it's 152 mm calibre tandem warhead is much more capable than the RPG-29 with 105 mm calibre warhead with precursor charge. According to Russian sources the Kornet ATGM can depending on version penetrate between 1,000 and 1,300 mm of steel armor, which given the missile's calibre and the penetration power of modern shaped charge warheads seems plausible. 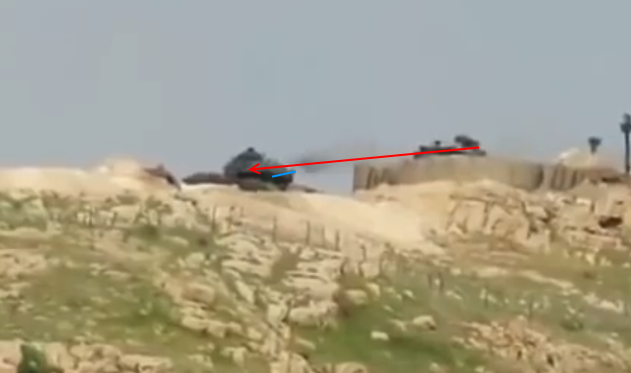 Above is a screen-capture from the video, which supposedly shows the same M60T being hit by the Kornet ATGM. While it cannot be said for sure that this is the same tank, sources like Jane's have claimed that the only reason for releasing the photograph of the damaged tank was to counter the terrorists' propaganda, which claimed that the M60T was destroyed by the Kornet missile. The screenshot from the video shows a number of interesting facts. Most importantly here is however the location and the angle of the impact. 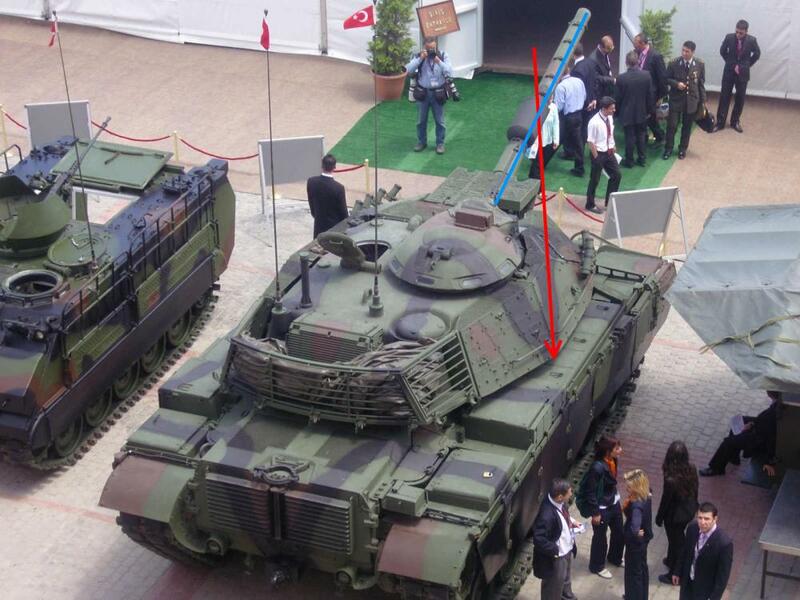 By comparing the position of the gun (marked in blue) to the path of the missile (marked in red), we can see that the missile approached from the left side (from the tank's perspective) and impacted on the righthand side of the turret frontal armor. This means that the missile passed the gun barrel and impact on the frontal armor below the gunner's sight at an angle, which made it impossible to hit the base turret behind the armor. The missile's impact path was facing away from the turret. The large module of spaced hybrid armor was probably the only reason why the missile detonated, otherwise it most likely would have missed given the extremely sleek turret cheeks of the M60 tank! Did the M60T survive a Kornet missile? Yes. Would the missile have hit the tank, if it wasn't for the additional armor module? Most likely not. If the missile had more penetration power, could it have penetrated the M60T's turret and killed the crew? Based on the angle from the video footage, no. Another important factor: The tank was at a much higher point from the location where the missile was fired. The missile had spent significant amount of its kinetic energy during flight, ascending to the tank. kornet uses HEAT warhead, it doesnt depend on distance or elevation,...the impact is same on every distance of flight.